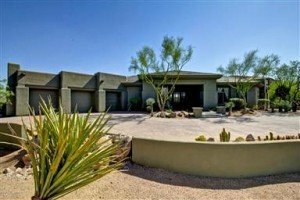 Troon North in north Scottsdale, Arizona is nestled in the foothills at a higher elevation than Phoenix and boasts stunning views of the valley and boulder outcroppings as well as cooler temperatures than Phoenix by several degrees! Troon North offers the finest southwestern golf lifestyle and sets the standard for luxury living for its residents. Troon North is a 1,800 acre master-planned golf community that features world-class amenities, gorgeous golf landscaping, golf courses, and a 37,000 square foot clubhouse for dining and entertaining guests. The Troon North Golf Club is regarded as one of Scottsdale’s finest, offering a one-of-a-kind desert golf experience with two internationally acclaimed 18-hole courses stretching through the natural ravines and foothills in the shadows of Pinnacle Peak – Monument and Pinnacle. Residents of Troon North can delight in the peaceful seclusion of private living but still within close proximity to everyday conveniences of grocery stores and upscale shopping, restaurants, a night out on the town, Scottsdale libraries, respected schools and medical facilities, including the world renowned Mayo Clinic and Hospital. Troon North homeowners can enjoy full residential amenities and services by joining Troon North Golf Club with a well-stocked pro shop, PGA certified instructors, a lavish clubhouse, heated community pool and spa and an on premise restaurant. Both social and golf memberships are available. 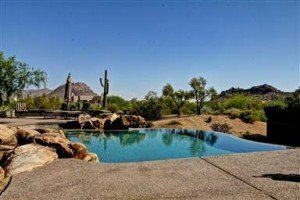 Troon North real estate is located within thirteen distinct neighborhoods including homes with scenic views of the mountains and city lights, eco-friendly estates, vacation properties, condos, townhomes, and homes with pool. Troon North gives definition to the southwestern luxury lifestyle where one can truly enjoy all that a good life and living has to offer. For inquiries on Troon North real estate in Scottsdale, Arizona, just Email or call us at 480-595-6412.